A new wave of socially responsible business has appeared, putting shared value and social impact in the heart of their activities. In this context, the authors examine shared value as basic component of the new version of social responsibility. Can innovative CSR approaches act effectively in managing the most damaging impacts of a crisis as the loss of trust and credibility and restore a company's reputation through various positive spillovers? Just before Christmas 2017, Lidl Hellas announced a digital campaign, with a social impact with the hashtag #apotalidl. Every use of the phrase in the digital world shall buy 10 meals for people on need. Here we see a complete sidestepping of any issue of recognition focusing on the lasting social effects. “Companies must take the lead in bringing business and society back together. The solution lies in the principle of shared value, which involves creating economic value in a way that also creates value for society by addressing its needs and challenges”, stated Porter and Kramer (2011, p.4) who defined Creating Shared Value (CSV) as “policies and operating practices that enhance the competitiveness of a company while simultaneously advancing the economic and social conditions in the communities in which they operate” (2011, p.6). We are living in an era of constant changes and major challenges. From environment to global economy and from refugee crisis to political instability, societies are always in a risk (Giddens, 1999). And while social challenges are growing, there is a bigger need for addressing them. The European Commission has previously defined Corporate Social Responsibility (CSR) as “a concept whereby companies integrate social and environmental concerns in their business operations and in their interaction with their stakeholders on a voluntary basis” (2001). 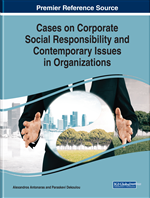 Ten years later and under the complexity of the current socioeconomic context, the Commission gave a brand new definition of CSR as “the responsibility of enterprises for their impacts on society with the aim of maximising the creation of shared value for their owners/shareholders and for their other stakeholders and society at large” (2011). At the same time, a new wave of social responsible business appeared putting shared value and social impact in the heart of their activities. Social business and social entrepreneurship “aim for value in the form of large-scale, transformational benefit that accrues either to a significant segment of society or to society at large” (Martin & Osberg, 2007) in a pursuit of “mission-related impact” (Dees, 2001). In this context, we will examine the concept of CSV integrated into CSR strategies, focusing on the case study of Lidl Hellas. Lidl Hellas has recently displayed an interesting CSR approach, effectively translating a constant stream of potentially negative exposure to a socially positive activity. Lidl grocery stores, at least in Greece, have been linked to inferior quality and products, mostly due to their german origin as normally happens in cases where “economic and financial policy measures that are perceived as offensive or unfair can cause feelings of animosity towards the “offending” country” (Nisco, Alessandro & Mainolfi, Giada & Marino, Vittoria & Napolitano, Maria, 2016, p. 59). There is even a popular catchphrase “X from Lidl” where X is a product or profession, like “manager from Lidl” meaning a less capable professional. Just before Christmas 2017, Lidl Hellas has launched a campaign under the name #apotalidl in which every use of the phrase in the digital world, intentional, funny or derogatory, shall buy 10 meals for people on need. There is an obvious CSR angle here, given the very real and enable existence of broad swaths of population in need, due to the crisis. The present analysis questions how CSV and CSR intersects with promotional culture and seeks to make a contribution to the body of knowledge by giving digital CSR strategies a broader meaning. In order to better understand, elaborate and support our research question we conducted an in depth interview with the Head of CSR of Lidl Hellas. In addition, we used data such as mentions, comments and reach on social media, plus the overall outcome of the campaign, as quantitative and qualitative indicators for measuring its success and social impact. This chapter exposes the ways in which a digital CSR campaign has an important role to play in improving the everyday lives of people and at the same time its social impact has positive spillover effects on a company’s reputation.